1. Is there a contract for a certain amount of time? No, there is no contract to sign and no amount of time that you need to maintain delivery. We encourage you to let us know if there is anything we can do to make the service work for you. However, we are quite sure once you try our fresh milk and products and the convenience of home delivery, you will not want to stop. We put our customers first, and do whatever we can to make your experience positive and delicious! 2. Is there a minimum order requirement? We have a monthly minimum requirement of $40.00 and a $10.00 monthly delivery charge. 3. Can I make Starlight Dairy a gift? 4. What is a standing order and how do I change it? Your standing order is the amount of product you would like to have delivered to you on a weekly basis. You may have different items delivered weekly, bi-weekly, every third week or monthly. 5. How does milk delivery work? 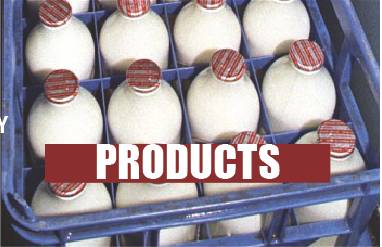 The milk is delivered in reusable glass bottles which are left in an insulated milk box, which can be purchased from us. Regular box is $35.00 which holds five half gallons plus extra products, large box is $40.00 which holds six half gallons plus extra products. The empty bottles are to be rinsed and placed in the milk box for pick up on the next delivery. 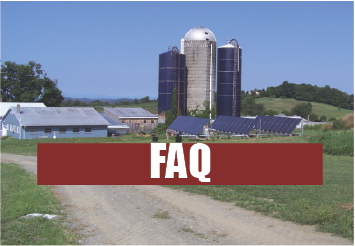 Although we do not charge a bottle deposit we will charge the $2.00 deposit, which we are charged from the farm, if the bottles are not returned. The bottles are made of heavy glass and can break, so please use caution in handling them. 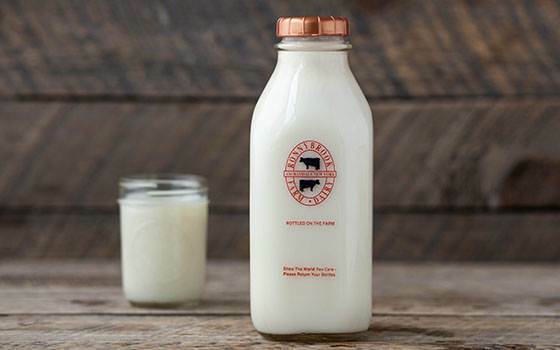 We believe the milk tastes better from a glass bottle and it also keeps the milk colder with no plastic taste or crossover. They are also environmentally friendly. 6. How do I know if/when you’ll be delivering to my area? Once you register, you will receive an e-mail to let you know what day we are in your area every week. For most of the year, we deliver between 1 AM and 7 AM, but our delivery hours may very due to weather conditions. 7. What if I go on vacation? You can hold your deliveries via your web account or send us an e-mail with the dates you need to suspend service. 8. What if my delivery day falls on a Holiday? You will be notified in advance of any Holiday delivery schedule changes which are usually adjusted prior to or after the Holiday. 9. What happens during bad weather? We will contact you if we are modifying our delivery schedule by either delivering earlier or later than usual. We make every attempt to complete our deliveries unless it irresponsible for us to be out on the roads. 10. What if I refer a friend? You may request milk samples for potential customers. You will receive a $25 credit on your invoice for any new customers referred after three months of deliveries. 11. Are there any winter or summer milk tips? Summer -- While the insulated milk boxes prevent milk from spoiling during the summer months it is wise to place the milk box in a shaded area and to remove and refrigerate the milk from the box as early as possible. Refrigeration should be set at 36 to 38 degrees to maintain a 10-12 day shelf life. Remember to rotate milk products in your refrigerator to reduce spoilage. FIFO = first one in, first one out! Shelf life is also extended by placing the bottles in the back of the refrigerator as opposed to the shelf on the door. Also, remember to rinse out your milk box on a regular basis to keep it clean. 1. Is there a guarantee? We offer a 100% guarantee. We strive to offer you the best home delivery experience possible. If you are not happy with a product, please contact us for a replacement. If you are still not totally satisfied, we offer a 100% refund. 2. What if I go on vacation? 3. What if my delivery day falls on a Holiday? 4. When will I receive my bill? Bills are produced monthly and are distributed with the first delivery of each month. There are several payment options. You can register for auto-pay via your web account and have payment deducted from your checking account. Your banking information is stored by the auto-pay processor who stores it on their servers using the latest encryption technology. We do not have access to or store your information locally once it is submitted. You may also pay via “on-line” banking via your bank. Payment must be made by the due date, or service will be terminated. 6. What if I refer a friend? 2. What is Creamline milk? Creamline milk is non-homogenized milk. It gets its name from the line that forms as the milk fat separates from the liquids as it sits in your refrigerator. The milk needs to be shaken before pouring to mix the milk fats back in. This is the least processed milk. Large dairy plants have been homogenizing milk for more than fifty years. The process began in earnest when dairy manufacturers stopped using glass bottles and switched to cardboard. Consumers could no longer see the cream line on the milk and when the cream flowed from the cardboard container, many consumers thought the milk was spoiled. Homogenization is a mechanical process which pulverizes the large butterfat globules and breaks them down to micron sized pieces. 3. Is the milk pasteurized? Our milk is processed at the lowest temperature allowed by law (170 degrees) keeping it safe, but not over processed. Many brands of organic of milk are “ultra” pasteurized at high temperatures. This gives the milk a slightly longer shelf life, but destroys beneficial enzymes and good bacteria as well as altering the taste. 4. What if I refer a friend? 5. 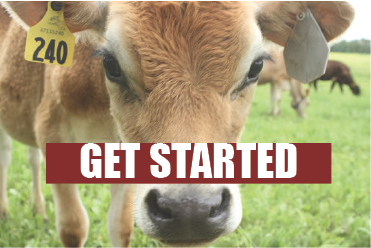 Are there any winter or summer milk tips? 2. Is there a contract for a certain amount of time? 4. What if I want to edit an order? You can always edit an order on-line, by phone, or e-mail until 7:00 PM the evening before your delivery. 5. Am I able to order on-line? Orders may be placed and managed on-line via your secure web account. You are able to view and modify current and future orders as well as view your account balance. 6. What if my delivery day falls on a Holiday? 7. What happens during bad weather? 8. What if I refer a friend?